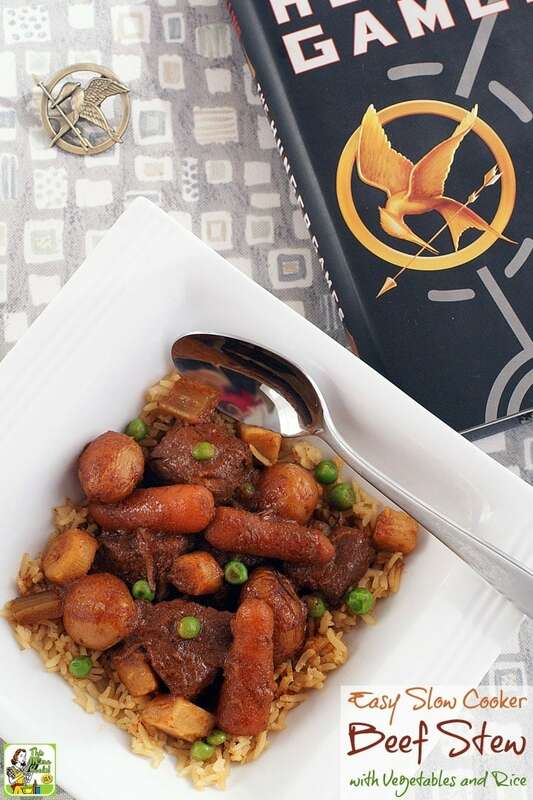 Easy Slow Cooker Beef Stew with Vegetables and Rice is inspired by The Hunger Games Trilogy and the movie based on the first book, The Hunger Games. For this homemade slow cooker beef stew, I was tasked with creating a recipe based on both as part of event from Cook the Books and Food 'n Flix. Heather from All Roads Lead to the Kitchen hosted the event. Rereading The Hunger Games Trilogy for this cooking project, I realized how fixated Katniss Everdeen was on food. People who wonder where their next meal will come from – if it comes at all – usually are. However, in the movie, The Hunger Games , Katniss wasn’t all that fixated on food. You never got the feeling that Katniss or any of the kids from the poorer districts were starving. They all looked too healthy! When deciding on my easy slow cooker beef stew recipe for the Cook the Books/Food ‘n Flix event, I took notes on the various dishes and foods that are mentioned in the book. One dish that caught my eye was described as “hot grain smothered in beef stew” or just hot grain and stew. So I decided to make an recipe for slow cooker beef stew based on Real Simple’s Slow Cooker Classic Beef Stew. 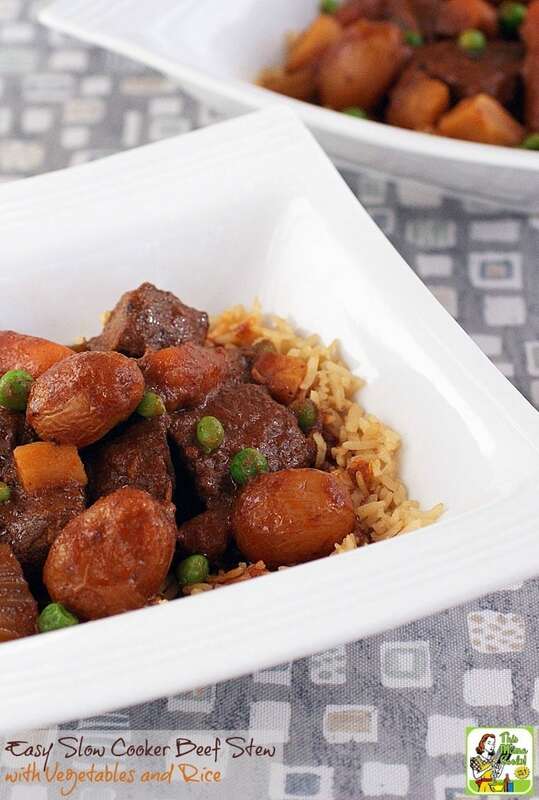 I modified their easy slow cooker beef stew to make a recipe that was gluten free, contained more root vegetables and peas, and was served on brown rice. The original recipe for easy slow cooker beef stew called for dredging the beef chunks in all-purpose flour. 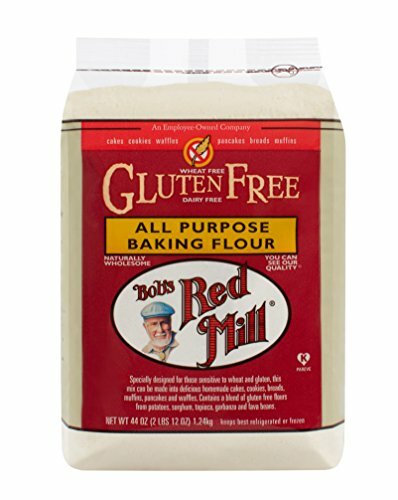 To make it gluten free, I substituted a gluten free all-purpose flour. 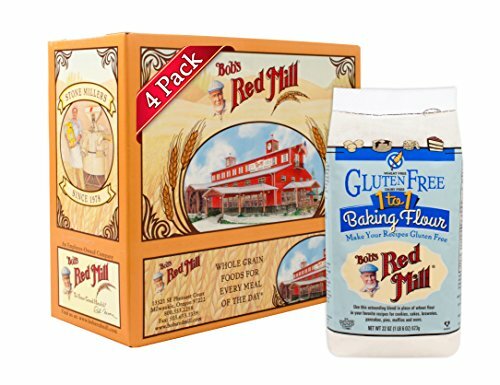 My two favorites are Bob's Red Mill Gluten Free All Purpose Baking Flour and Bobs Red Mill Gluten-Free 1-to-1 Baking Flour. While the gluten free flour thickens the homemade slow cooker beef stew, it does add a calories – fine if you're Katniss and need some fattening up. However, if you’re watching your calorie intake, here’s a healthier, gluten free way to thicken the stew. Omit the flour, and season the beef with salt and pepper to taste. In a large skillet, heat 3 tablespoons of olive oil on medium-high heat. Brown the meat as directed. Follow the rest of the recipe. About 30 minutes before serving, mix 3 tablespoons corn or rice starch with 3 tablespoons of liquid from the slow cooker. Add the mixture to the stew and stir. Put the lid back on the crock pot and turn up the heat to the High setting. After 30 minutes, stir and serve stew over rice. If you need to avoid corn products and can’t use corn starch, I recommend using rice starch in this easy slow cooker beef stew. 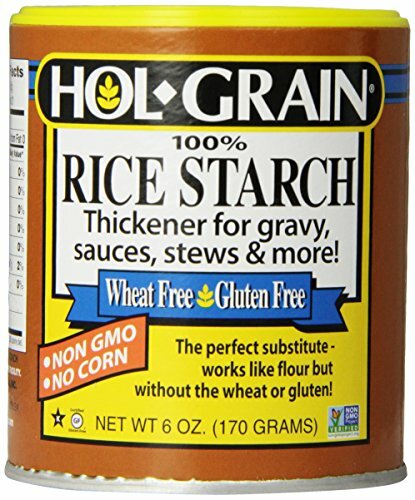 I love using it as it works just as well as corn starch in thickening stews and soups. You can find it in Asian markets or purchase it online. To save time when making this recipe for slow cooker beef stew, dice onions using a Vremi Food Chopper. 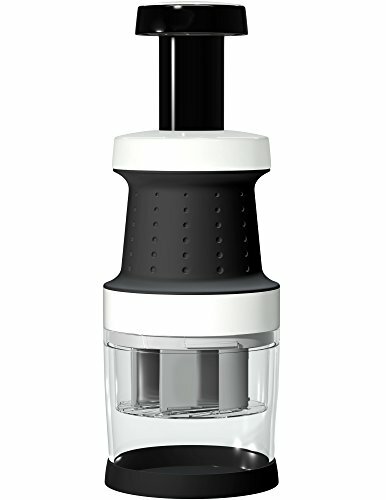 I have a similar chopper (from Pampered Chef) and LOVE IT. Not only does it save time, but my eyes don’t water when chopping onions. The Vremi has amazing reviews on Amazon, too! I used baby carrots since they’re already peeled and small enough for the simple slow cooker beef stew. If you’re gluten free, make sure you choose a gluten free beef broth. I like Imagine Organic Beef Broth and Pacific Natural Foods Organic Low Sodium Beef Broth. If you don’t drink wine, use more beef broth instead. Also, while I’ve served this with brown rice that was cooked with the leftover beef broth I had on hand, you can use white rice, quinoa, or wild rice in this Easy Slow Cooker Beef Stew recipe. Coat the beef in the flour. Heat 3 tablespoons of the oil in a large skillet over medium-high heat. Brown the meat, a few pieces at a time, adding more oil as necessary. Throw out any unused flour. Transfer browned beef to a large capacity (4 to 6 quart) slow cooker. Add the diced onions to the skillet. Cook over medium heat until tender, about 10 minutes. Stir in the tomato paste and coat the onions. Transfer the onion and tomato mixture to the slow cooker. Pour the wine into the skillet and scrape up any browned bits. Pour the liquid into the slow cooker. Stir in the potatoes, carrots, parsnips, celery, beef broth, salt, thyme, and bay leaf. About 15 minutes before serving, add the peas and cook until heated through. Serve on top of brown rice. Originally published on January 24, 2013. Updated with new pictures and information. Posted in Books, Crock Pot and Slow Cooker, Gluten Free, Movies, Recipes, Veggies and tagged beef, rice on October 10, 2016 by Anne-Marie Nichols. I just bought a slow cooker and am going to give this recipe a try this weekend. Thank you so much for posting it! Is there a good substitute that can be used in place of the wine? I don’t use wine. Just use more broth, Alice. That should work fine. This sounds wonderful! I’m thinking of cooking it in a Dutch oven though as my slow cooker is much too small… thoughts? Alicia, maybe 4 hours at 350? I’d check after 3 hours and keep an eye out to make sure there’s always plenty of broth in your Dutch oven. You can always add more or some water if it starts drying out. you did not say how much wine is it ounces or cups or spoons ??????? Thanks for catching that Barbara! It’s 1 1/2 cups. Hope to have you join again again! Lovely looking stew. Unfortunately I overcooked mine, so it didn’t look so good, but it tasted really good. I’ve enjoyed looking through your blog. You have lots of interesting information. I particularly like the nutritional analysis you provide. Great work! Are you kidding me? Your stew looked delicious along with everything else you made, Ana! Thanks for the pin Kelli! Looks yummy! I love that you did a healthier take. I am switching up my diet to eliminate white starches, so I will have to keep an eye on your blog! Having a great time and can’t wait for next month! I just ordered the book on Amazon and have the Food N Flix book in my Netflix queue. Yes, look into making a reservation at Tristan. It’s worth every penny and the food and service are marvelous! 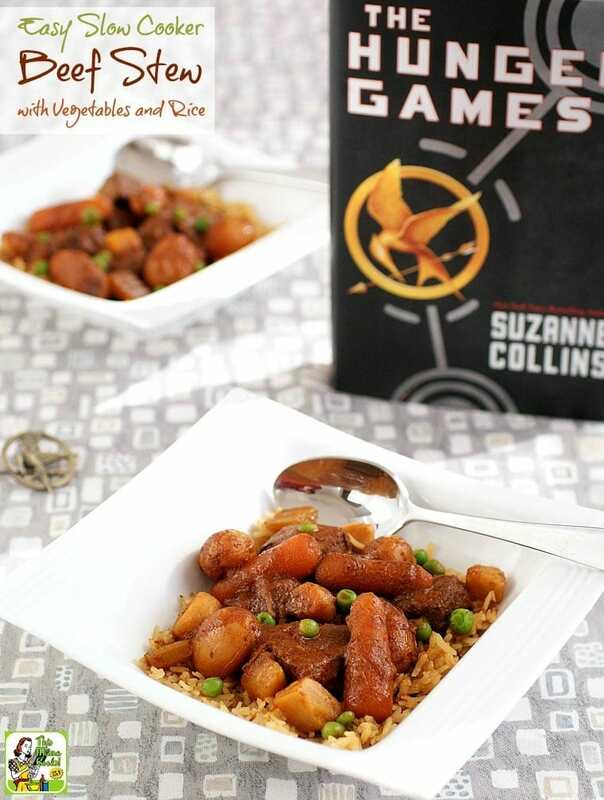 A perfect dish for Cook the Books and the Hunger Games. Your comments about the book were very apt. Great discussion and so glad you joined us for this double-feature! This stew sounds amazing. Perfect meal for this wintery weather and a great pairing with the book and movie. I’m glad you found Cook the Books! Glad I found Cook the Books, too! I certainly will be staying with both blogging events! 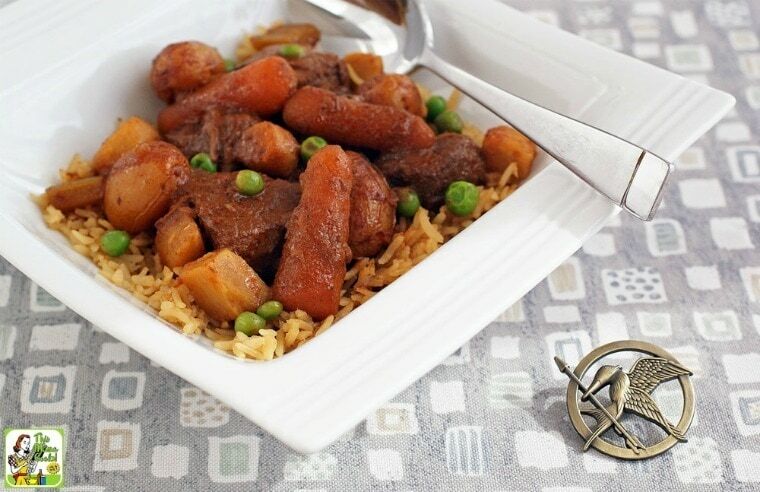 I think Katniss found this stew very comforting, too!